Karen Flint, Risk Director from Gilbane Building Company, accepts award. 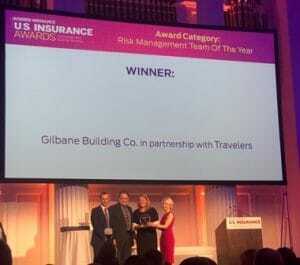 Providence, RI – March 25, 2019 – Gilbane Building Company today announced that it, along with Travelers, has been recognized as the Risk Management Team of the Year by Business Insurance magazine for its innovative approach to using technology and real-time data to improve worker safety across construction sites. The companies are collaborating to explore the potential safety benefits of Triax Technologies’ Spot-r devices. As part of the collaboration, which was announced last fall, Travelers will review workforce and safety data from a variety of Triax’s Spot-r IoT devices being used across several Gilbane projects. This includes the wearable Spot-r Clip, which enables faster injury response times by automatically detecting and documenting worker falls and allowing employees to report hazards or signal distress from anywhere on site. The sites will also have Spot-r EvacTags, which emit emergency alarms to expedite site evacuations and provide real-time worker locations to monitor egress. The data will be used to determine how wearable technology can keep workers safe. The second annual Business Insurance U.S. Insurance Awards honor professionals working on specific projects in the commercial insurance and risk management sector. The finalists were selected by senior Business Insurance staff from nominations submitted to the publication. The Teams of the Year, which were announced at the awards event in New York on March 21, were determined by an independent panel of judges composed of risk managers from a variety of backgrounds and industries. Business Insurance is a leading news and information source for executives concerned about risk and its impact on their businesses. Gilbane provides a full slate of construction and facilities-related services — from preconstruction planning and integrated consulting capabilities to comprehensive construction management, general contracting, design-build and facility management services — for clients across various markets. Founded in 1873 and still a privately held, family-owned company, Gilbane has more than 45 office locations worldwide. Gilbane has built some of the most complex and celebrated construction projects in the nation and has been recognized for excellence in safety by the Construction Users Roundtable (CURT) and the Associated General Contractors of America (AGC). For more information, visit www.gilbaneco.com.